Chris Shane, Haden, FBI agent, and beloved only child of a wealthy African-American family returns as the first-person narrator of Head On. The novel’s plot concerns a new professional sport called hilketa. The name comes from the Basque word for “murder,” and it’s a game that would not have been possible before the development of threeps because the object is to remove the head of an opposing player and transport it across the goal line or, failing that, to kick it or throw it between the goalposts. All the bodies on the field are robotic, so losing a head isn’t a huge deal. At least it’s not supposed to be. During an exhibition match, a player’s threep is victimized for the third time in the same game, and that player — a Haden whose body is located far from the field — dies. The death could hardly come at a worse time for the North American professional hilketa league. This particular match is an exhibition for potential investors who might take the game global. Chris Shane’s parents are there, as potential owners of a future Washington, DC franchise. Suddenly, the league looks really bad when it wants to look really good. The PR people panic and pull the online stats of the dead player; now it’s starting to look like a cover-up. Chris is at the game as an adviser to his parents — and Scalzi gets in a few jabs about how wealthy, privileged people are likely to treat threeps — and so he is on the scene early after the player, Duane Chapman, dies. Then one of the PR people really panics and hangs himself; or does it just look like he did? I raced through Head On in about a day and a half, so he clearly got the balance right for me. The machinations made sense, as did the motivations. I was surprised by some of the violence in the story, but that is as it should be. Bad things are seldom telegraphed in real life, there’s no reason why near-future crime should be any different. I don’t think that Scalzi would kill off Chris or Vann, but other characters (with the possible exception of Chris’ parents) are not under authorial protection, and the antagonists have shown from the beginning that they are indifferent to people’s lives when scads of money are involved. 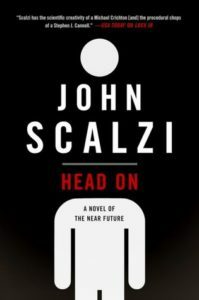 Along with Scalzi’s trademark snappy dialog and fast reversals of positions, there’s also a good look at corruption in business in general, and sports in particular. Many thousands of people get emotionally attached to their teams. Some dozens make vast sums of money off of that attachment, and some of those people are not particularly scrupulous about what it takes to keep the money flowing. Will Chris and Vann find and catch the culprits in time? Only if they keep their heads on.